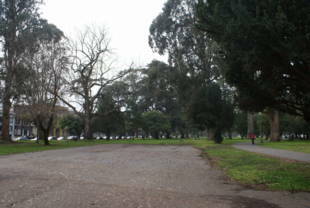 The Panhandle is a stretch of park that extends from the east edge of Golden Gate Park to Baker Street. It is bordered by Fell St. and Oak St. from the north and south. 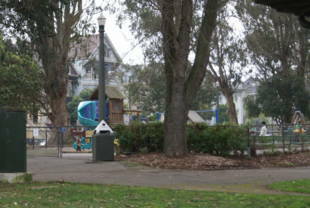 This park is also bounded by the Haight-Ashbury and Western Addition districts. 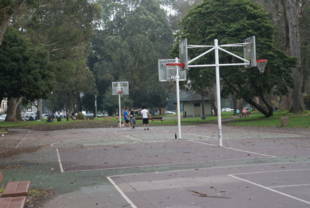 This park has a children's playground and basketball courts; and there are restrooms (and water faucets) in the middle of the park at Ashbury St. Biking/jogging trails wind along both the north and south edges of the park. 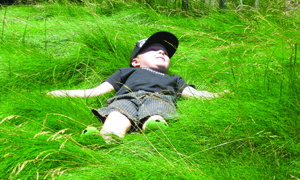 There are also plenty of benches to sit on and take in the scenery. 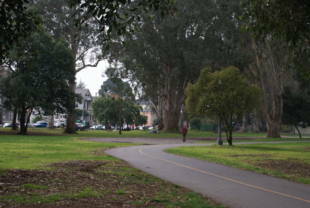 The Panhandle is owned by the San Francisco Recreation and Park Department. N-Judah -- Carl and Cole; walk six blocks north or take the 43-Masonic bus. 5-Fulton -- Several points along Fulton Street between Stanyan and Masonic; walk three blocks south to the Panhandle. 21-Hayes -- Several points along Hayes Street between Stanyan and Baker; walk one block south to the Panhandle. 24-Divisidero -- Divisidero and Oak; walk two blocks west. 71-Haight/Noriega -- along Haight Street, any stop between Stanyan and Baker/Buena Vista East. Walk two blocks north upon exiting. The 6-Parnassus and 33-Stanyan also stop at points along Haight accessible to the Panhandle.